Why is that? What is the theory behind this? Imagine you make an "inside-out" scatterplot where the $n$ subjects are the axes and the $2$ variables $X$ and $Y$ are the points. This is called a subject space plot (as opposed to usual variable space plot). Because there is only 2 points to plot, all dimensions in such a space except just any two arbitrary dimensions that are able to support the 2 points plus the origin, are redundant and can be safely dropped. And so we are left with a plane. We draw vector arrows from the origin to the points: these are our variables $X$ and $Y$ as vectors in the subject space of the data. Now, if the variables were centered then, in a subject space, the cosine of the angle between their vectors is their correlation coefficient. On the pic below $X$ and $Y$ vectors are orthogonal: their $r=0$. Uncorrelatedness was a prerequisite outlined by @Dilip in their answer. Also for variables centered, their vector lengths in a subject space are their standard deviations. On the pic, $X$ and $Y$ are of equal length, - equal variances was also a prerequisite made by @Dilip. 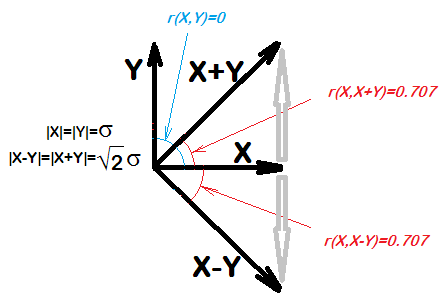 To draw the variable $X-Y$ or variable $X+Y$ we just use vector addition or subtraction that we've forgotten since school (move Y vector over to the end of X vector and invert direction in case of subtraction, - this is shown by grey arrows on the pic, - then draw a vector to where the grey arrow points). I believe that there's a simple intuition based on symmetry here, too. Since X and Y have the same distributions and have a covariance of 0, the relationship of X ± Y with X should "explain" half of the variation in X ± Y; the other half should be explained by Y. So R2 should be 1/2, which means R is 1/√2 ≈ 0.707. Here's a simple way to think about why there's a correlation here at all. Imagine what goes on when you subtract two distributions. If the value of x is low then, on average, x - y will be a lower value than if the value of x is high. As x increases then x - y increase, on average, and thus, a positive correlation. Not the answer you're looking for? Browse other questions tagged correlation random-variable intuition or ask your own question. Does the first principal component differ from simply computing the mean of all variables? What is the correlation coefficient between two zero random variables? Why does the Phi coefficient approximates the Pearson's correlation? How to compute the correlation coefficient between continuous and discrete variables ?